Jamyang Dorjee Chakrishar is a Tibetan Calligrapher and a teacher. He lives in Sikkim state of India. 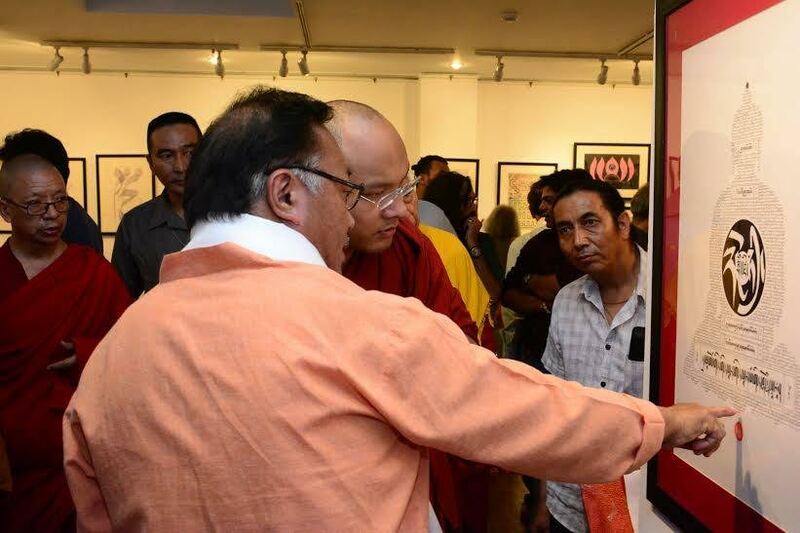 Jamyang’s calligraphy is a harmonious dance of Buddhist images and elements with his passion for Tibetan language. His rich nature of art encompassing Buddha’s Body, Speech and Mind all in one inspired Lama Zopa Rinpoche to call it “Dharma Art”. Calligrapher Jamyang Dorjee Chakrishar is one master of this tradition and has studied under great masters Geshe Lobsang Tharchin and Professor Samdhong Rinpoche in School in Shimla, India. In 2010, he wrote a 165 meter-long Tibetan calligraphy, creating a world record for the longest calligraphy scroll in the world. His work focuses on the u-med style where brushworks are exhibited freely representing the depth, flexibility and artistic flavor of the Tibetan calligraphy. 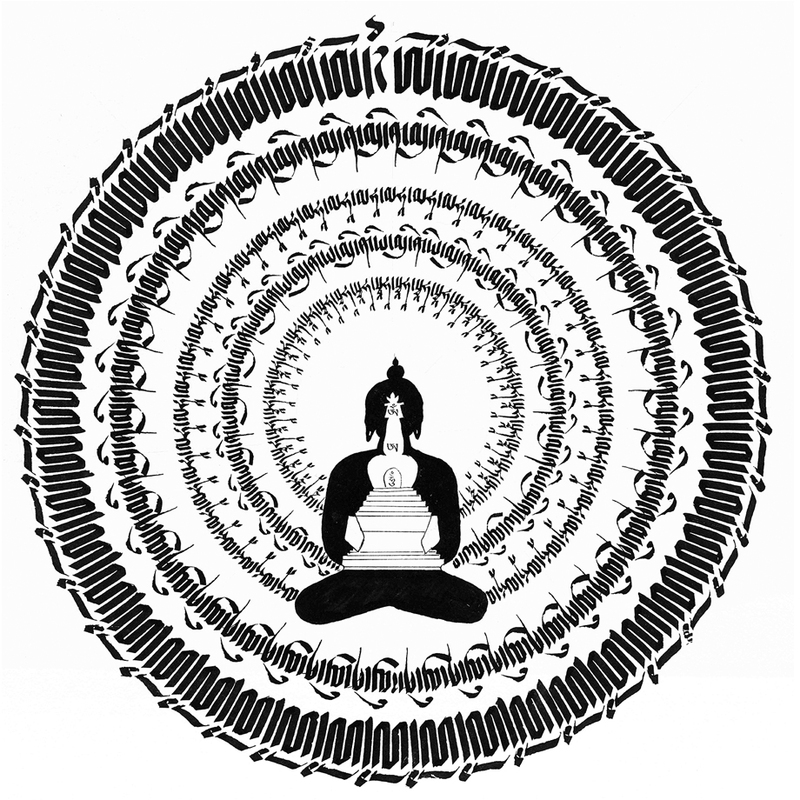 His other innovation is the depiction of Buddhist deities in miniature calligraphy. They are very unique and much appreciated by all Buddhist masters including His Holiness the Dalai Lama himself. 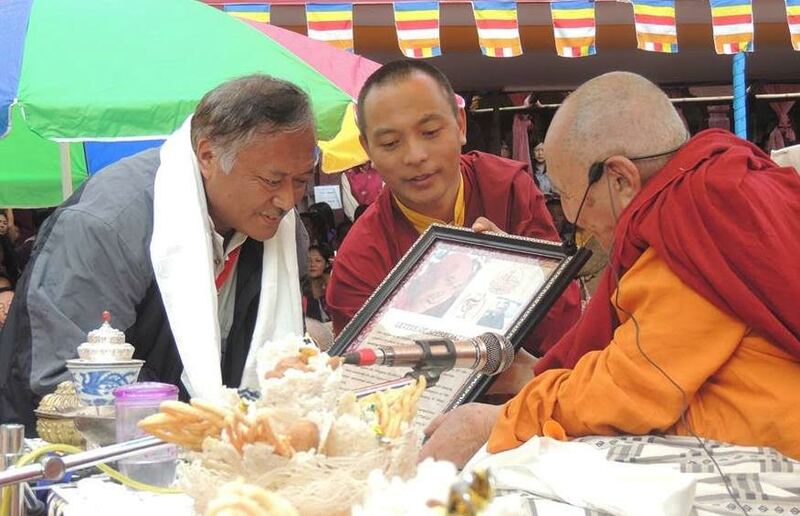 Currently he runs a Dharma Center called ‘Lhatsun Dharma Centre’ in Rabongla, South Sikkim where local dharma students are taught Buddhist texts and chantings. Boldly experimenting with various mediums and styles, Jamyang’s work is a constantly evolving art where contemporary style and technique meets the rich cultural heritage of Buddhism and the Tibetan language. Geshe la was popularly known to our generation in exile as Shimla choe-ge (spiritual teacher of Shimla School). It was most fortunate to have met such a wonderful teacher who taught us the basic foundation of Tibetan language including calligraphy and whose kindness can never be repaid in many lives. 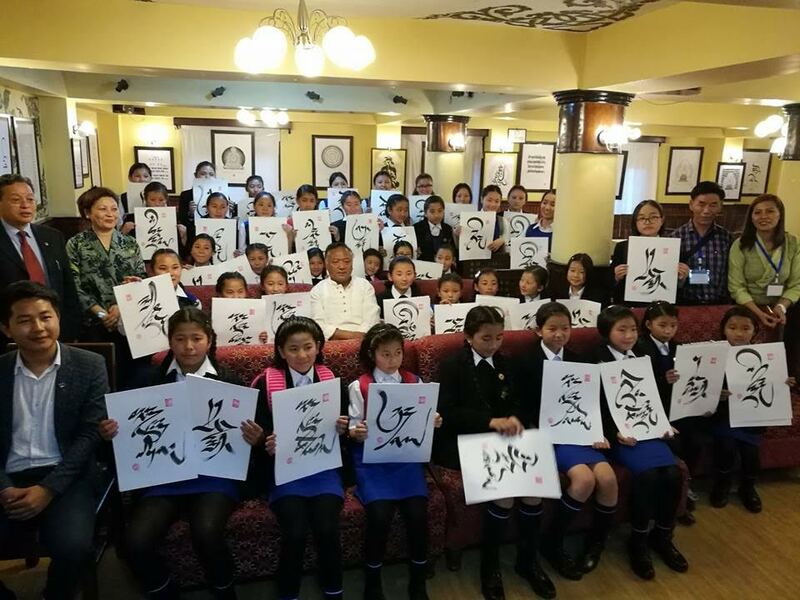 As a refugee student in Tibetan school, Shimla, we learnt the basics of Tibetan calligraphy on wooden plans with bamboo reeds, a practice abandoned these days in schools. Geshe la escaped to India in 1959, with His Holiness, the 14th Dalai Lama, and tens of thousands of other Tibetans. He was on the board of expert committee who wrote the first Tibetan textbooks for a Tibetan curriculum to be used in refugee schools. He taught in Darjeeling, Shimla, and Mussoorie. 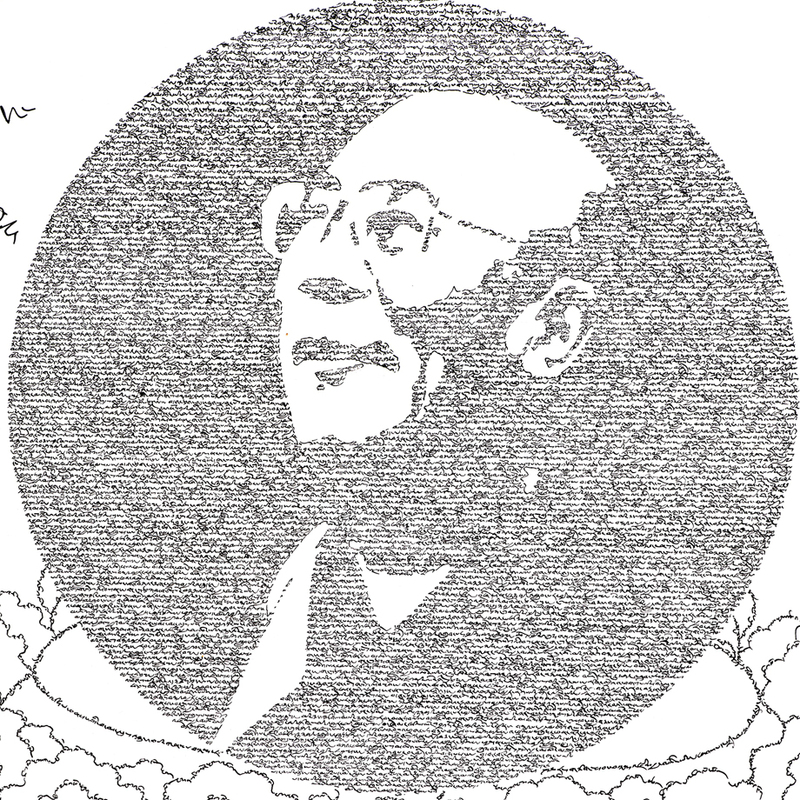 In 1972, Geshe la was chosen by H.H. 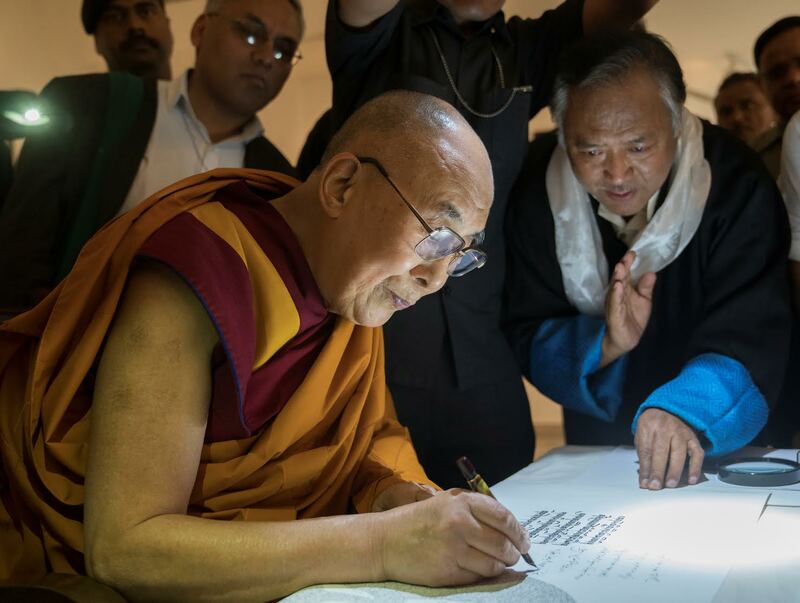 the Dalai Lama to come to the United States to participate in a project involving the translation of Buddhist scriptures. Upon its completion, he was invited to serve as the Abbot of Rashi Gempil Ling Temple in New Jersey, a position that he held until his recent demise, on December 1, 2004. The Himalayan Buddhist transmission tradition in visual art forms does not limit itself to phurba and thangka paintings, but also exists in a large corpus – textual forms that extend artistically to calligraphic works, as seen in ancient leaves and manuscript covers. For centuries the calligraphic tradition continues in Tibetan script until modern days, with works by contemporary masters such as Trungpa Rinpoche.